“Where did that come from?” Tonight I was taking a few moments to read something that my husband had written when I saw a message online that had come from someone who had deeply hurt me last year. I had been in a very tender place due to the death of my father and this person (whom I had known all of my life) came and assumed something false about me and then proceeded to act upon the assumption in a very public way. In very “Kathi-like” fashion I tried to immediately process all of the emotions so that I could quickly forgive and move on. The problem was that my quick processing must have skipped the forgiveness part of the equation. I didn’t realize this until tonight when I saw this person’s name and their message that had made it appear as if this wounding never occurred. In that moment I realized that I was mad and hurt and had not forgiven them. I instantly wanted to lash out and send a very pointed message back to them. I am not a hot tempered person so I knew that this was a sure sign of something unresolved. Quickly the line from 1 Corinthians 13 came to mind, “Love does not keep a record of wrongs…”. I have not only kept a record of this wrong but from looking at my reaction I wondered if I had even tried to love this person or just merely chosen to forget them rather than forgive them. Back to the days of “What would Jesus do?”! First, He would have forgiven so that He could forget the offense rather than forget the person. Second, He would not have wanted to lash out in selfish anger the way that I wanted to. How many times has He forgiven me for far worse offenses? More times than I can count. How many times has He loved me after I failed Him once again and yet He never brought up the previous failure? Every time! I thought because I had forgotten the that I had forgiven but forgetting the person is not forgiving the person. My forgiveness cannot be based upon their willingness to apologize, my forgiveness has to be based on the fact that God has asked me to love my neighbor as myself. So, now I have an opportunity to free both of us. I can free them from the offense that I have carried (or in this case buried) and I can free myself from the hidden anger, which is most likely masking pain. Forgiveness can free us both. I will have to ask Jesus what this forgiveness is suppose to look like on the outside as well as on the inside. I wonder at times if my desire to quickly process and forgive is more of a quick escape from letting God go to the deeper places where the offense hit a tender wound. This time I will take the time needed to process and pray. I will remember to love the person as I forgive them. 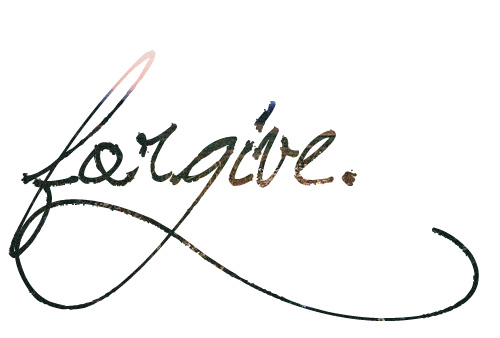 Note to self…forgetting someone is not the same as forgiving someone! I really get what your saying here. I had a friend of 16 yrs who offended me by making fun of my belief in the Lord, and even hoped, and sarcastically said to others the opposite of what God had shown me. That really hurt since I was witnessing to the others as well, and had only a few nights before went to the ocean with her for prayer and a salvation baptism. Of course I stopped talking to her..forgave..so I thought, and another 16 yrs went by before she re appeared in my life through Face book wanting to reconnect and come visit, wanting to meet my family after she had made such a open show about my faith and beliefs before my first son was born. I was immediately angry and went off like a rocket..I wrote her back a nasty long letter via message. Needless to say but, God grabbed me by the shirt collar, and I had to look at that seriously and make an amends. When true forgiveness came, I was set free as well as she is. I have chosen to stay out of her life, but I can speak with her family without hurt and anger rising up in my gut. Freedom is a wonderful thing..and Thank you Lord Jesus for leading us through it to live like you, and LOVE your children like you do. I love your ending comments…wise words for us all to ponder. They say that time heals. I have not often found that to be true unless I partner with God to be healed. Often all time does is traps our emotions inside of us. God is good to bring thing around like He did in your life so we can be truly healed and make things right.